The sporadically blogged about Green Lab Notebook app continues to make progress: shown to the right is a preview of the most central feature, editing of experiments. 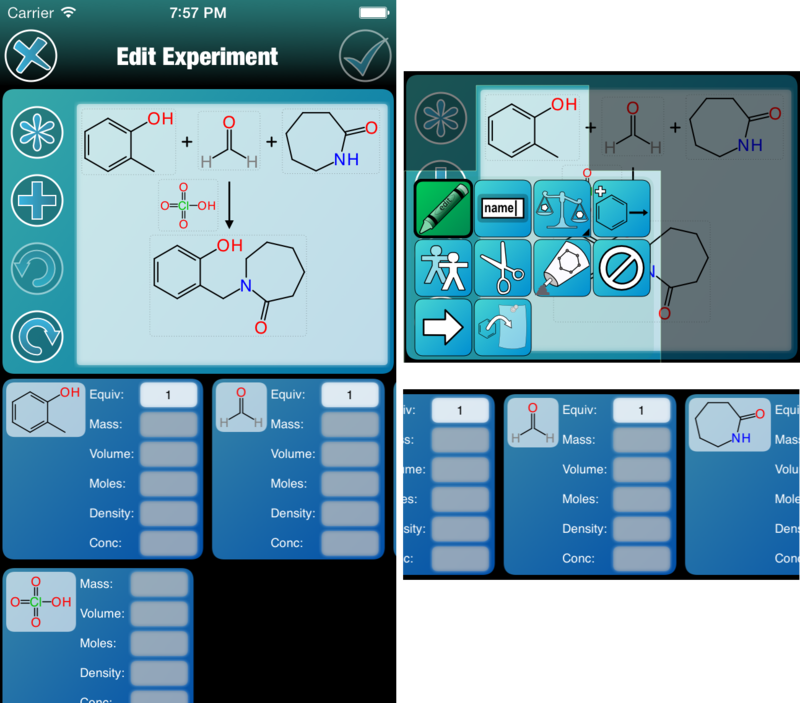 While the app is in some ways a next-level-up version of Yield101, which has been on the AppStore for years, it is moving slowly because I’m taking a lot of time to apply the lessons learned from countless hours exploring ways to bring cheminformatics to mobile devices, and honouring all the goals of shallow learning curve and a frictionless user experience. At the same time it has to move cheminformatics forward a step or two, and stay in keeping with structure-first digital purity, that can be archived much more effectively than most of the ad hoc methods in current use. The core datastructure of an “experiment” is backward compatible with the reaction and yield schemas used by other apps (e.g. MMDS, Reaction101 and Yield101), but it is being incrementally extended, starting with the use of multiple reaction steps. For the user interface of specifying an experiment, it is all component-based (as opposed to a freeform canvas like most PC-based chemical drawing packages). One of the lessons learned from creating apps, which is obvious in retrospect, is to keep almost all of the main functionality accessible on the current view. So the main area, which shows the reaction pieces, turns each of the reaction components (reactants, reagents and products) into buttons. Tap on any of them, and a context menu comes up: all the add, edit, delete, move, modify commands are available. Double tap and go straight to the editor. When there’s no component at a reaction stage, an icon with “?” is shown, and tapping on that allows creation of a new entry. Underneath the main reaction schema is a list of items in the quantity block. There is one line for each stage/type (i.e. reactants, reagents and products each get one, and so on for subsequent reaction steps). Because these can take up a lot of screen space, especially on an iPhone, each line is side-scrolling: swipe left or right to select the area of interest, and tap on any of the quantity boxes to specify how much. As with Yield101, the quantities will be interconverted automatically, using stoichiometry, structure to get molecular weight, to convert between mass, volume, density, concentration and moles. These screenshots will become increasingly complete as we get closer to mid-March: one of my talks at the American Chemical Society Meeting in Dallas is about this product.